Talks between Russian President Vladimir Putin and his Ukranian counterpart Viktor Yanukovich were held at the Russian president’s residence outside of Moscow in early March. The meeting was held behind closed doors, with the media only allowed to cover the official potion and with no Q&A for journalists. However, during the formal exchange of remarks in front of the cameras, a Russian correspondent interrupted the conversation between the two presidents to ask Putin whether Ukraine’s accession to the Customs Union (CU) would be discussed. The Ukrainian president’s visit to Russia was initially scheduled for last December, and the main topic was to be Ukraine’s accession to the CU. Ukraine canceled the visit at the eleventh hour, explaining that Yanukovich needed more time to prepare for the meeting. Rumor has it that Moscow tried to press the issue in December and proposed that Kiev sign documents that would initiate the process of Ukraine’s accession to the CU. Observers note that Kiev cannot afford to be left out of the Union. Still, joining the CU would effectively force Ukraine to say goodbye to its coveted integration with Europe. The Customs Union (CU) is the first serious economic project in the post-Soviet space. It is a form of trade and economic integration between Russia, Belarus and Kazakhstan. The CU envisions a single customs territory within which there would be no customs duties or economic restrictions other than special protective anti-dumping and compensatory measures. CU countries would use a single customs tariff and uniform measures to regulate the trade of goods with third-party countries. By forming this union, Russia, Kazakhstan and Belarus would have a combined GDP almost equal to that of Germany. During his visit to Russia on Mar. 4, Yanukovich apparently tried to convince Putin that Kiev is not opposed to taking part in the integration process, but it could not do so on Moscow’s terms. Ahead of his visit, Yanukovich repeatedly mentioned that Ukraine could enter the Customs Union as an observer or find a cooperation model that would not preclude its integration with Europe. Yanukovich stated that Ukraine’s trade with the Customs Union countries in 2012 amounted to $63 billion, while trade with European Union countries totaled $50 billion. “Our national interests, our economic interests are there [in the Customs Union zone] and we have no right to lose anything there. 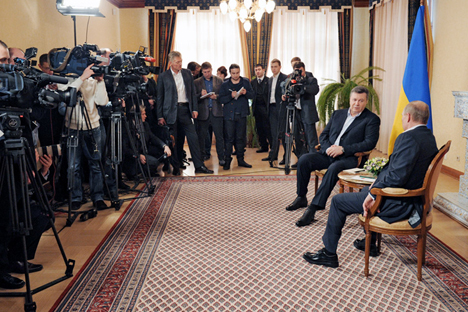 We are not tough or rich enough to neglect such cooperation,” said Yanukovich. Russia also stands to gain from Ukraine’s accession to the CU. Moscow hopes this would grant easy access to Ukraine’s gas transportation system to Europe. Ukraine’s gas transport system is one of the largest in the world. It carries Russian natural gas to consumers in 18 European countries. However, the CU and the European Union are mutually exclusive for Ukraine. As European Commission President José Manuel Barroso said at a February meeting with Yanukovich in Brussels, Ukraine will have to make a choice. “One country cannot simultaneously be a member of the Customs Union and have a deep and far-reaching free trade zone with the European Union,” said Barroso. Kiev expects to sign an association agreement with the EU at the Eastern Partnership summit in November this year. However, experts are skeptical. Late last year, German Chancellor Angela Merkel announced that the European Union would be unable to admit new members and that, in the future, candidates for EU membership would be more thoroughly screened for compliance with the required level of economic development. “At the end of the day, Ukraine will have to join the Customs Union in a weakened state and on Moscow’s terms,” Sergei Markov, a Russian political scientist and vice rector of the Plekhanov Russian University of Economics, told RBTH. Thus, the likelihood of Ukraine joining the CU increases. He believes Kiev will not have substantive negotiations with Moscow until it becomes apparent that an agreement with the European Union will not be signed. This could become clear as early as June-October, says Fesenko.